There is Goodman’s sonnet voice: rambunctious, funny, full of old jazz: “Cans cranked, I love to listen past the studio tricks/ and catch a hint of any discarded ghost line/ mistakenly laid down when a mic bleeds through./ First thought, best thought? Cue take two.” Though infrequent (“First Queer Poem” and “Improvisation” are it) the sonnets do a considerable amount of work for the collection. 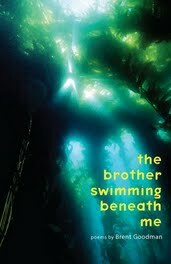 Far more active than the detailed-driven poems, they also buoy up the final and most important voice in the brother swimming beneath me: Goodman’s clear grief. “Grief begins with how,/ not why,” the poet writes in “Evaporation.” Years after the death of his brother, the speaker of these poems still wrangles with the astonishing sorrow of fraternal absence: “Dear dropout sick/ of school, your blood swallows wind. Grief/ begins with every story I try to tell. I wasn’t there,/ your hair thinning to nothing. My mouth burns cold.” The repetition of phrases in these poems represents that haunting—it’s hard proof that one never gets past the tragedy but only learns how to turn it off. Goodman knows well the place where one is free to turn it back on. He goes there: the light is different every day. The poems in the brother swimming beneath me have incredible range and because of this Brent Goodman is a writer to watch.